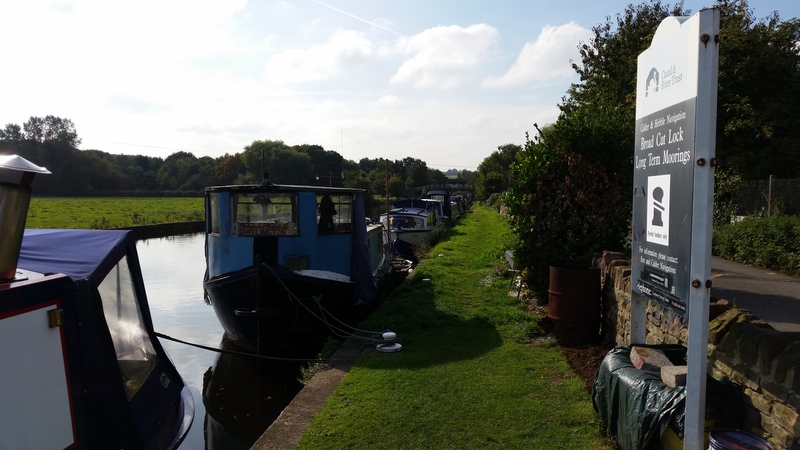 Broad Cut Moorings are situated within the South Pennines on the Calder & Hebble Navigation close to the M1 and Wakefield. The linear moorings are arranged over a distance of approximately 320m along the towpath. There is currently space to moor up to 20 wide beam or narrowbeam craft. The moorings are at Calder Grove, approximately four miles from Wakefield. To access the site follow the Broad Cut Road from the A636, Denby Dale Road. Sandal & Agbrigg, Wakefield Westgate & Kirkgate. The water point is near Broad Cut Low Lock, approximately 50 metres from the end of the moorings. The car parks are at opposite ends of the site and both provide access onto the moorings. The bin store area is next to the top car park. All facilities are for the use of all customers. Vehicle access, through the wooden gate covering the road into the site, requires a standard CRT key. These are available at the cost of £7 each. Mooring bollards may need to be shared due to spacing and to best manage the water space. All customer items must be stored on boats and not on the bank side. The land next to the mooring must not be cultivated or altered by customers. There is no parking available on the access road running along the site and all customers should use the car parks at either end of the moorings. The site is easily accessible at all times. If you are intending to the view the moorings, please have respect for other users at the site.